The vibrant Indigenous culture, friendly local characters and magnificent landscapes you’ll encounter on this Top End journey will leave you spellbound. Cruise waterways teeming with wildlife, stay in safari-style accommodation in idyllic locations, and immerse yourself in the culture of the traditional Aboriginal owners of the lands you’re exploring. A myriad of deep gorges, plunging waterfalls and tranquil rock-pools add to the drama of your Top End experience. 5 nights departing select dates April - September 2019. Incldues accommodation, guide, airport transfers, daily breakfast, 2 lunches & 5 dinners. Toast a Top End sunset on Mindil Beach. Get lost exploring colourful Mindil Beach Sunset Market. Explore the amazing Litchfield National Park. .Gaze in awe at the Top End’s fascinating Termite Mounds. Jump in the water for a refreshing dip at Wangi Falls. 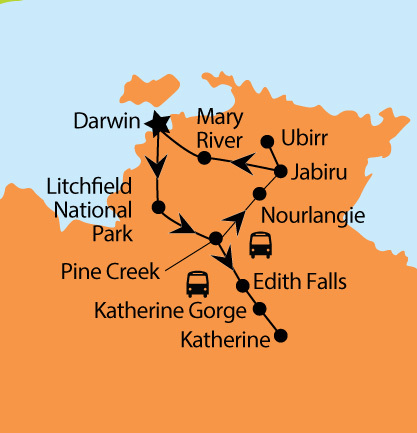 Cruise on Katherine Gorge & see ancient rock art. Taste bush tucker & throw a spear with the Jawoyn Community. Swim at glorious Edith Falls. Discover the wilderness of Kakadu National Park. Climb to Nourlangie Lookout for spectacular views. View the rock art galleries of Ubirr in Kakadu. Stay in luxury at Wildman Wilderness Lodge. Enjoy a spectacular Top End wetland sunset. Enjoy a safari cruise on Corroboree Billabong.